Drum Roll…!!!!!!! Yes, the junior parkrun wristbands have finally arrived! For those who may have missed all the social media frenzy over the past few days we are pleased to announce that the little rubbery bands turned up on the parkrun HQ doorstep last week. Did we say we were elated!? It was like Santa Claus had come early, and we couldn’t wait to whip the package from the postie’s hands and unwrap them! 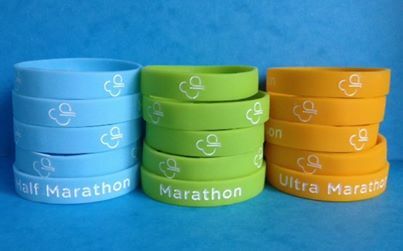 So, for those who haven’t seen them here is a photo of the new junior parkrun ‘club’ wristbands in all their lovely coloured, rubbery glory. So what’s the reason for the bands and how do I get my… hands (or wrists!) on one, two or three I hear you cry? At its heart, parkrun is all about participation … As with the 5k parkruns we want to reward this, and encourage (and even incentivise) children to take part in regular physical activity. So when we were developing the junior parkrun policy we decided to follow the general parkrun principal of rewarding for participation milestones. The parkrun t-shirts are fantastic, however, we wanted to choose something that was (a) totally unique to the junior series (b) ‘one-size-fits-all’ (eg, doesn’t come in XS, S, M and L) and (c) really really appealing to our younger runners. After extensive deliberation we finally settled on the idea of wristbands, which are durable, easy to transport/store and children can even wear all three if they want to! Next came the wider rebranding of junior parkrun (more about this exciting topic in a future Newsletter). As part of this process we needed to develop the junior colour scheme, logo, symbol and mascots. Not an easy task, but one that was actually a huge amount of fun (especially the last one – designing and selecting the junior mascots, which we will be revealing very soon!). Only after we had finally settled on the colour palette, font and symbol could we finally put in the wristband order. As you will see in the photo, the bands have the name of the club as well as the new junior parkrun symbol on them. All junior event teams are being sent a stack of bands to distribute to the lucky and worthy junior parkrun recipients. However, only those aged between the magic numbers of 4 and 14 are eligible… so all the over 14s will have to look on with envy at the latest junior bling! And we’re pleased to say that they will be awarded retrospectively, which means that all the previous 2k junior runs (but not 5k parkruns) will count towards the total number of runs. The launch of the wristbands marks another exciting step forward for junior parkrun, and yet another excuse to get those hands in the air! We really hope that the juniors love the blue/green/orange bands as much as we do, and are looking forward to wearing them ALL with pride! This entry was posted in junior newsletter, Newsletter and tagged juniors by chrissie. Bookmark the permalink.